[United States of America]. Government of the Philippine Islands. 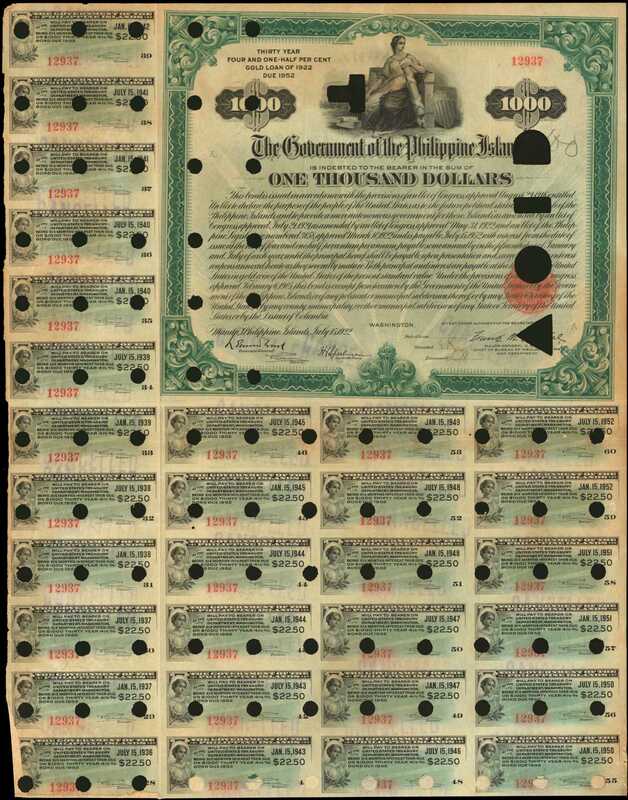 Act of August 29, 1916.. $1000 4-1/2% 30 Year Gold Loan Due 1952. July 5, 1922. Issued and Cancelled. Fine.This is a rare bond and only the second example confirmed by us. A beautiful intaglio engraved certificate printed by the BEP. Issued and cancelled bond for this American possession ceded from Spain after the Spanish American War. The bond, 30 years term, was due in 1952, is dated from Washington and has the engraved signature of the Major General from the War Department. BEP coupons under and left side. 24.0cm by 20cm (excluding coupons). Green frame and large green sunburst tint. Red seal. Seated America at top center, flanked by $1000 dies. Green back with two different female vignettes in oval, flanking the bond panel. No. 12939. There are 27 clipped coupons cancelled with multiple holes and large "VOID." Cancel holes in remaining coupons. The only other example we have seen was in the Pineda Collection sold in 2012 by Lyn Knight. Obtained at the 1990 Memphis Show from Jerry Briggs. Supposedly two were found then and the other belonged to Frank Nowak, dealer from Prescott, AZ. Lightly toned, except for cancels. This is sharp.